As online shopping’s popularity continues to grow, the concept of a shopping mall seems to contradict everything consumers seek from online – limited hours, small range of shops, and difficult access through usually limited parking. However a number of shopping malls around the country see potential in the mall format, and are expanding their offering with multi-million dollar investments. Newmarket, Commercial Bay and Sylvia Park are just some of the malls undergoing large expansions, adding more retail space, carparking and food options in order to meet the changing demands of consumers, and continue to add to the appeal of the bricks and mortar shopping experience. Overall, total spending at malls is growing at a relatively slow pace. Over the last 12 months, spending at shopping malls throughout the country has grown just 0.3% compared to a year prior, while transactions have increased 1.7%. These figures are behind the 4.0% growth of total retail (excluding fuel) over the same period, and 4.3% transaction growth. However CBD’s*, another main competitor of shopping malls (aside from online), have seen only slightly stronger growth over the same period, up 0.8% over the last 12 months, while transactions have grown a stronger 2.5%. The sales figures for these areas are depicted in the (indexed) chart below. While total sales may be slow, there are some specific storetypes that are seeing success in malls. In the past, the high street may have been the pick when wanting to hit the shops. Now, malls look to be the new destination of choice for Kiwi’s needing a traditional retail fix. Over the last 12 months, many discretionary storetypes have seen stronger growth at malls compared to city centres. These include appliances (5.9% in malls compared to 2.2% in CBD’s), sports and camping stores (5.9% vs. 3.1%), and toy and game retailers (2.8% vs. 0.8%). 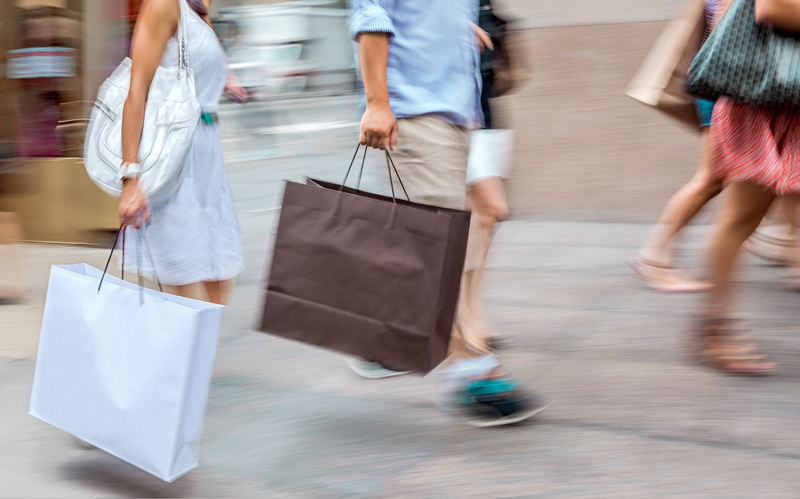 Clothing, department stores, books and stationery and footwear retailers also all saw stronger results in malls compared to city centres, further suggesting that Kiwis are choosing malls over the city to shop for non-essential purchases. While Kiwis are heading to malls to spend up in some stores, they are still favouring the cities to eat and drink. Over the past 12 months, spending growth in central city bars, cafes and restaurants (6.3%) and takeaways (10.1%) have exceeded their mall equivalents (3.0% and 7.2% respectively). Although behind their city counterparts in overall growth rates, hospitality providers at New Zealand malls are starting to evolve and enhance their offering. Since June last year, hospitality providers in malls have seen an increase in higher value customers, as the number of transactions valued $50-$99 increased 10.7%, while those spending $100-$199 per transaction have increased 5.4%, an indication that Kiwis are starting to buy more meals at malls, rather than just snacks or treats. The contrasting growth figures between malls and CBD’s highlight the definite changes happening in how and where people are spending their money, particularly with discretionary purchases. Kiwis are slowly but surely changing their shopping habits, heading to malls for shopping sprees on ‘treat’ purchases such as clothing, electronics and toys, and choosing cities for food and drinks out – at least for now. It is no coincidence that big international retailers such as Zara and H&M have chosen to open up shop in our biggest malls, rather than on the high street. While contradicting some of the appeals of online shopping, malls do offer many benefits to shoppers, such as everything under one roof, and the (growing) opportunity to grab a meal at the same time, conveniences that mall owners are taking the opportunity to cash in on while the iron is hot.